A mindset is a way of thinking – a belief that influences how you think about yourself, others and the world in general. Your beliefs determine your behaviour and drive your attitude towards people and situations every day. For example, I believe that everyone has the ability to be creative, and that by learning, developing and applying creative thinking skills, it is possible to increase your creativity quotient. However, as I discuss later, not everyone shares my belief! In her groundbreaking book, Mindset: The New Psychology of Success, Stanford University psychologist Carol Dweck, identifies two different types of mindset – the fixed mindset and the growth mindset. In her pioneering research, she found that people’s belief system about their own intelligence and ability, had a significant impact on their motivation, effort and performance. A fixed mindset is a belief that your intelligence, talent and personality are inherently fixed and unchanging. In other words, you have a certain amount and nothing can change it. The ultimate desire in an individual with a fixed mindset is to be the best and to be seen as talented and perfect. This leads them to need constant validation and they seek to prove themselves over and over. Failure is simply not an option and they are extremely sensitive about making mistakes and being wrong. In the event that they do fail, they instantly become discouraged, give up and label themselves a ‘failure’. They avoid new challenges and will not risk doing anything that might expose their weaknesses and flaws. A growth mindset is the belief that your intelligence, talent and personality can be developed and cultivated through your actions. They believe that by learning and through constant practice, anyone can do anything. Their desire to become a better person fuels their passion to grow, take risks and do new things and they thrive on being challenged. For them, feedback is essential and provides them with constructive evidence to improve their performance and develop their abilities. In the event of failure, they see the setback as an opportunity to learn and simply think, ‘I failed’, and vow to try harder next time. Do you believe that to be good at sports, you must have natural talent? Or do you believe that anyone can be good at sports if they learn the skills and by constantly practicing? Athletes with a fixed mindset believe that they have an innate talent for their sport – a natural gift. It is important for them to be constantly validated through their own winning performance and to be seen as a winner through the eyes of others. Needless to say, they hate to lose and when they do, they find it hard to cope and become disheartened and disillusioned. Their typical coping mechanism in the face of defeat, is to make excuses and/or assign blame to someone or something else for their loss. However, athletes with the growth mindset believe that talent is cultivated through effort. They focus their mental energy on the process of improvement and will work hard to achieve success. The outcome is the by-product of their training, motivation and passion. Win or lose, they strive to make their best effort, and in the event of a loss, they return to practice motivated and inspired to try harder. This is the mind of a champion with a winning mentality. Do you believe that leaders are born or made? The fixed mindset belief is that leaders are born and that they have a natural talent for leadership. They believe that some people are superior and some are inferior, and this is reflected in their attitude towards their subordinates. As leaders, they need to prove and display their superiority and will engage in power struggles with other leaders to validate their position. Organisations run by fixed mindset leaders often have a culture of power, eliteness and competitiveness. Conversely, organisations run by growth mindset leaders tend to have a culture of creativity and collaboration. They believe in the potential of their people and focus on providing opportunities for continuous growth and development. Growth mindset leaders inspire and empower others. They strive to create an environment in which teamwork, communication and innovation are proactively encouraged, and where everyone can thrive. A study by culture-shaping firm, Senn Delaney, conducted collaborative research with Carol Dweck, into the benefits of fostering a growth mindset in organisations. They discovered that employees working in a growth mindset culture have greater trust in their company and feel more ownership and commitment to the future of the business. In addition, they agree that their company supports risk-taking and foster innovation. They also disagree that their organisation is rife with unethical behaviour. To read more about this research, click here. Many organisations, including Microsoft, are transforming from fixed mindsets to growth mindsets in order to build healthy, high-performing cultures. Click here to read a Harvard Business Review article about how Microsoft are using the growth mindset to develop leaders. 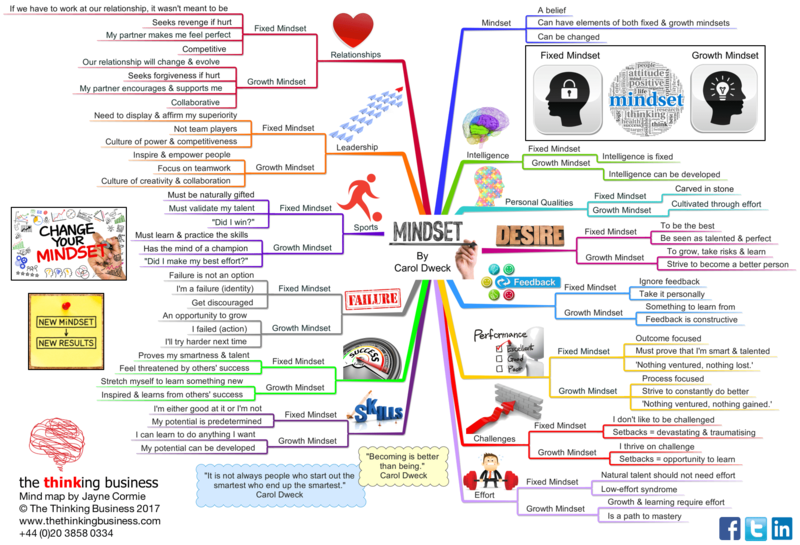 One of the key reasons that I decided to this blog post to accompany the mind map I created, is to discuss the impact of mindset on creativity and innovation. Over the last 17 years, I have been providing thinking skills training courses to many organisations, including Warner Bros., Microsoft, Selfridges & Co., Whitestuff, Penguin Random House and many more. During that time, I have become eternally fascinated with what makes organisations and their employees tick. I have witnessed first-hand how mindset affects thoughts, attitudes and behaviours at the organisational, team and individual levels, and the impact mindset has on group dynamics and personal performance. In the training room, the fixed mindset manifests itself in two main ways. Sometimes, it is ego-driven with the predominant behaviour focused on proving their superiority with either their fellow delegates and/or the training consultant. They have an inherent need to prove that they are more creative, know more about creative thinking, have more experience in the field of creativity or have achieved greater creative success than everyone else in the room, especially the trainer. At other times, the delegate believes that people are either creative or not, and that creativity cannot be taught. In those who think they aren’t creative, they will try to belittle the need for creativity and will argue that logic is more important than imagination. They are often highly resistant to learning the new tools and reluctantly participate in the group thinking sessions. In addition, they will give in, make excuses and/or assign blame if the tools and techniques don’t immediately work for them. Growth mind-set delegates believe that it is possible to learn anything by developing the skills and then consistently practicing to reach the level of mastery. They are open-minded, willing to learn, and actively participate in the training. They listen, ask questions, are curious, take risks and push themselves out of their comfort zones in order to challenge themselves to grow and develop new skills. When they don’t understand something, they proactively seek to find clarity and will persist with their learning until they do understand. They also provide constructive feedback as to what they liked/didn’t like about the training, and what improvements can be made. We’ve all heard the saying, ‘Success is a journey, not a destination.’ This means that the process is more important than the outcome. Of course we all want to achieve success, but a fixation on the end-result, can lead to stress and fear of failure. It is most important for fixed mindset individuals to look good and be the best, so they often avoid taking action in case they fail. Tony Robbins calls this the ‘pain-pleasure’ syndrome. They will do more to avoid the pain of failure than they will to achieve the pleasure of success. However, the opposite is true of people with a growth mindset. They also want to achieve their desired outcome but they understand that it is a process, which requires practice, effort and motivation. Their success is often a by-product of their dedication to the craft, whether it be a sport, business or a relationship. Encourage your delegates to celebrate the small wins along the way to achieving the end goal. Teach them the process behind the skill and provide them with the opportunity to practice, get feedback and ask questions. Dweck’s research showed that ability can be developed through sheer effort and hard work, as opposed to natural talent. This is the key principle behind the concept of the growth mindset. However, most children are praised for their achievements by parents and educators, and rewards are given for attainment not effort. In a growth mindset culture, praise and feedback is given for hard work and effort, not just for talent and ability. This means that in the training room, delegates should be praised for their willingness to try and for giving their best effort in every task, not purely on the outcome they achieve. J.K. Rowling’s first Harry Potter book was rejected by 12 publishers before it was eventually accepted and published. But she never gave up and the book went on the sell over 4oo million copies. So create a safe learning environment which is conducive to the delegates trying new things, taking risks and pushing beyond their comfort zone. Encourage them to learn from their mistakes and use failure and setbacks as an opportunity to grow. Teach them the difference between ‘I am a failure’ and ‘I failed’, and instil the need to manage their motivation and keep moving forwards. People with a fixed mindset feel threatened by the success of others. However, in growth mindset individuals, the success of others is a massive source of inspiration for them personally, and they love to see others being successful. It takes consistent practice, patience and persistence to reach the level of mastery in anything – there are no quick fixes. Remember the 10,000 hours principle? The process of learning does not stop at the end of the training day. In fact, that’s when the real learning begins as delegates begin to apply their skills in their everyday work. Therefore, it is important that the delegates understand the need for consistent practice in order to embed the learning and to develop their proficiency. Create a mechanism to provide post-training support in the form of follow-up emails, webinars, online courses etc. Proactively encourage your delegates to feedback their progress, successes and failures in order that you can provide them with continuous development and inspiration into the future. 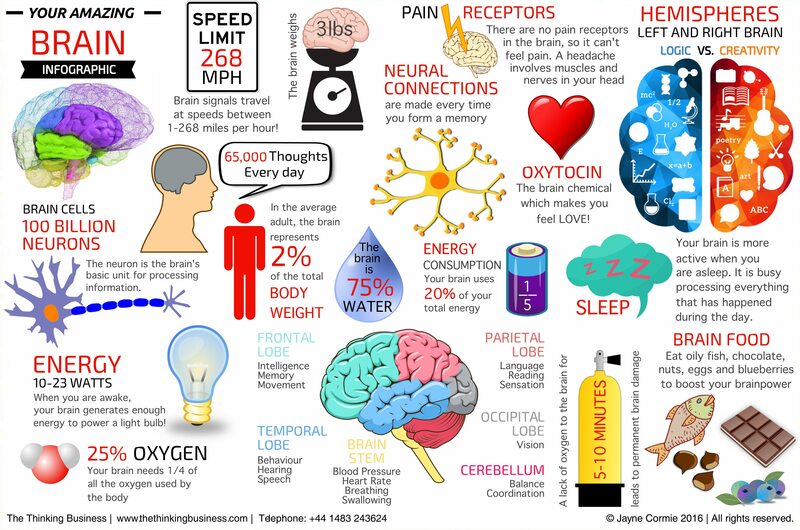 A picture paints a thousand words – so here is an infographic of your amazing brain featuring fascinating facts and visual information.